Ever wondered what would it feel like to meet your favourite celebrity, especially if it is THE Shah Rukh Khan? Wouldn’t that be the best moment of your life? Well, obviously! The same happened with a fan who happened to see Shah Rukh at the song launch of Beech Beech Mein song from Jab Harry Met Sejal. When he saw his favourite superstar, he couldn’t help but get all emotional. While the paparazzi couldn’t get enough of the actor as he headed to his car post the song launch event, this crazy fan somehow managed to get into the middle of the crowd and started to cry. Shah Rukh saw that and immediately called him ahead to take a selfie with him. 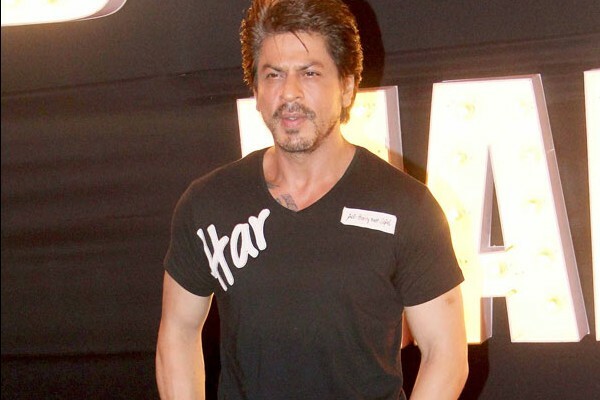 Aww, Shah Rukh… You are such a sweetheart! The video of this fan crying badly is going viral on social media. In case if you haven’t watched it, here’s the link..
Shah Rukh Khan and Anushka Sharma were present at the song launch of Beech Beech Mein, the second song from their film Harry Met Sejal. It’s a peppy track, a perfect party number from the SRK – Anushka starrer. While most of Shah Rukh Khan’s fans have given it a thumbs up, some of them aren’t very happy with it. So as far as social media is concerned, the song has got mixed responses so far. As for us, we think Radha, the first song from the film is our personal favourite! Talking about Jab Harry Mei Sejal, the film has been in the news ever since film maker Imtiaz Ali started working on it. Anushka and Shah Rukh‘s on screen pairing has been loved by many in Rab Ne Bana Di Jodi and Jab Tak Hai Jaan and this is their third film together. We don’t quite know if they will be able to recreate the magic in Jab Harry Met Sejal but let’s hope that the storyline turns out to be an interesting one. The film is scheduled to release on August 4, 2017. Aishwarya’s father Krishnaraj Rai’s funeral: Shah Rukh Khan & Bhansali pay final respects!